Not quite November rain, but definately a gloriously wet March 3rd 1979 as 25176 drifts through Manchester Victoria. Behind the locomotive is the holding siding for the Manchester Victoria pilot and the banking locomotives for Miles Platting bank, a duty that was frequently in the hands of a Class 25. The twenty two year six week career of D7526/25176 included four months allocated to Eastern Region depots then followed by a lengthy career allocated to London Midland Region depots. Time between last Classified repair and withdrawal: 101 months. February 1965 to March (31B). May 1965 to Finsbury Park (34G) on loan. June 1965 to Nottingham Division (D16). October 1971 to London Division (D01). After withdrawal 25176 remained at Longsight until July 27th when it made an unusual trip (9L45) to Ashburys Yard, returning to Longsight on August 1st!! Its final journey began on November 26th 1987 when it was moved as 09.41 9K13 to Crewe South Yard, then on December 12th tripped to Basford Hall. Two days later it was off to Bescot as the 9X12 06.41, followed by the 9D15 12.03 Bescot to Toton, being detached at Humberstone Road on December 17th. The next day Leicester stabling point was its next port of call, spending the Christmas break here. On January 6th 1988 it was collected by the regular Bescot - Toton freight to spend a day at Toton. It travelled south on January 8th in the 8G15 Toton - Bescot freight, being detached at Leicester. It was tripped to Humberstone Road on January 21st, then into Vic Berry's Yard on January 25th. By July 1988 25176 was no more. Noted Derby Works August - October 1978 (Dual brake equipment fitted). D7526 was delivered from Derby Works to the Midland Lines during January 1965 as part of the large fleet used to remove steam from the Midland Lines northwards. D7526 was quickly transferred to March (31B) in February and then briefly to Finsbury Park (34G) in May. By June D7526 was back on the Midland Lines (ML) with her many sisters. An Open Day at Leeds Holbeck on September 30th, marking the twilight of steam in the area, especially of the few remaining Jubilees, found the following Sulzer Type 2s on 'display': D5096, 5100/73/79, 5254/90, 7526/48/68-70/95 & 7625. On the late evening of May 25th 7526 was noted at Stonebridge Park coupled to 7529. The summer holiday 'weeks' in a number of the Midland towns brought increased traffic to the regular services and the usual extras. Leicester's holiday period commenced July 3rd with a heavily strengthened London service and extras to Skegness with 25176 & 25178 and to Yarmouth with 25165 & 25280. 25176 was noted at Frodingham along with 25102 & 25212. 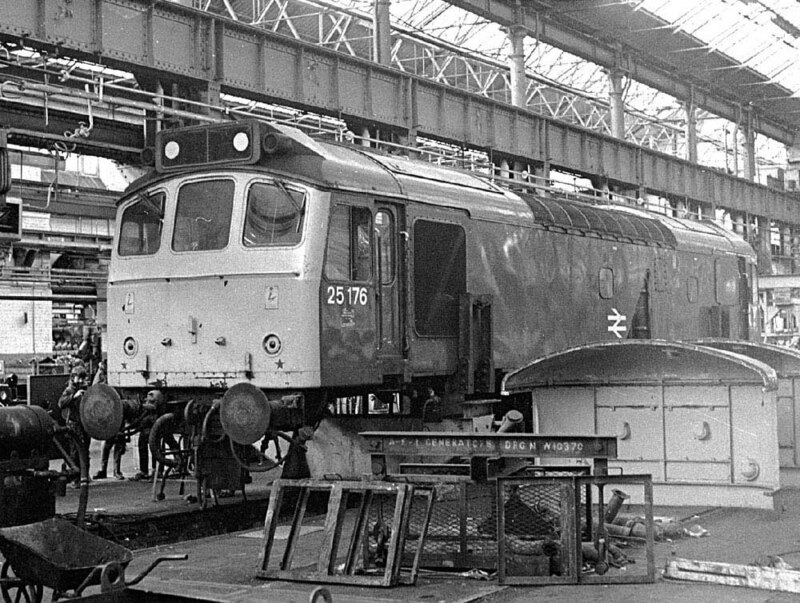 September & October for 25176 were spent at Derby under repair, including the fitting of dual-braking equipment. On March 12th 25178 assisted the 14.04 St Pancras - Derby when 45104 suffered a loss of power. On July 14th 25176 & 25051 worked the 6A33 09.10 Daw Mill Colliery - Pitstone Cement Works (Tring) loaded merry-go-round. 25176 was noted at Wakefield Kirkgate with flat wagons carrying steel girders on a gloomy November 13th. On a snowy December 11th 25176 with snow ploughs at each end was noted passing Market Harborough on the up line. 25176 was northbound at Sharnbrook with ballast wagons on August 3rd. An 'E' examination for 25176 was carried out at Toton during August 1982. 25176 was noted at Bletchley on August 28th. Blea Moor was a poor place for 47455 to fail whilst working a charter on October 30th. The train had stopped to detach pilot 31115 (from Hellifield), but was unable to restart, ninety minutes passed until 25189 & 25176 arrived taking the train on to Culgaith, where they were replaced by 37048 for the run to Carlisle. New traffic flows of gas pipes in November brought pairs of Class 25s from Leith South to St Helens or Warrington, the trains of twenty six bolsters required banking between Garswood & Shaw Street. Noted on November 3rd were 25176 & 25078 banked by 25109 whilst the next day produced 25059 & 25180 banked by 40090. 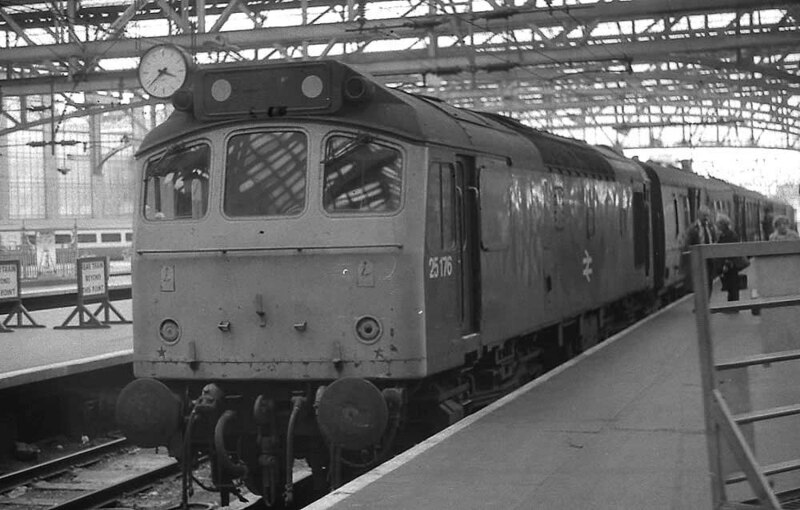 On an unknown date in August the 1S81 Carlisle - Perth was worked by 25176. 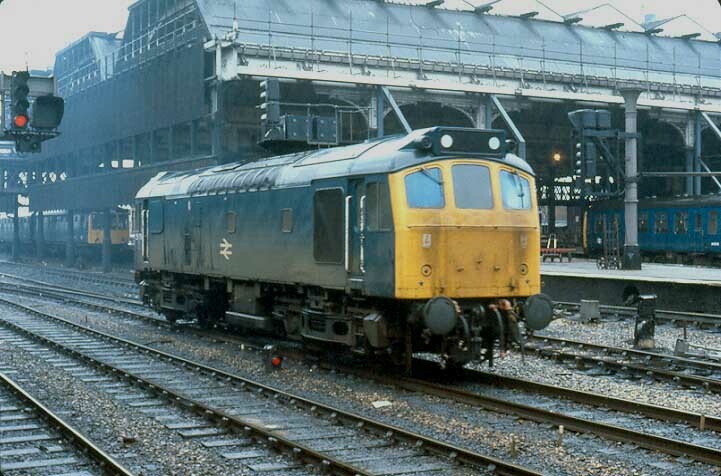 For 25176 December 1983 & January 1984 were spent at Derby, with unclassified repairs made to the power unit, a visit to Derby by this time was a risky venture as many Class 25s went in for minor repair work and were condemned following the discovery of more serious woes. Many that found themselves in this unfortunate position did provide many spares to keep the ever dwindling fleet running a little longer. Photograph courtesy Tony Sayer During December 1983 & January 1984 25176 spent time at Derby Works for power unit repairs, seen here on January 14th. Class 25s visiting Derby Works at this late stage in their working lives risked the possibility of withdrawal following discovery of other needed work that would then exceed the cash limits set for repair work on the Class 25s. On February 5th 251762 was stabled at Severn Tunnel Junction, the next day it worked the 08.15 to Gloucester. The majority of 25176's recorded passenger miles during 1984 were short hops in the Preston area, the first occurring on February 17th with a Preston - Blackpool North job, taking forward the 18.05 from Euston. 25176 was stabled at Cockshute on April 7th. 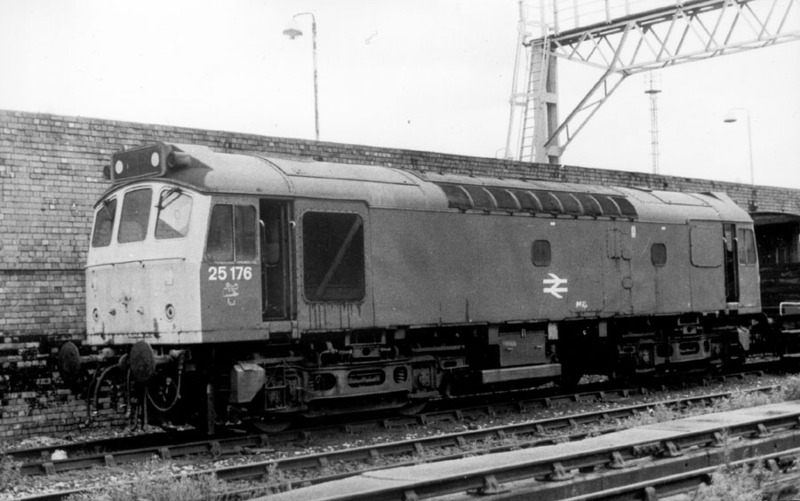 Swindon finally received three Class 27s from Scotland for repair at the end of April, they were noted arriving at Gloucester on April 26th behind 25176. A week later, on May 1st 25076 & 25176 were unusual power for a Lackenby - Scunthorpe special. 25176 was at Newton Heath depot on May 26th. On July 31st 25176 surprisingly worked the 07.25 Glasgow - Carlisle with 25207, it returned alone on the 12.40 ex Carlisle. The Ditton BOC - Broughton Lane tanks continued the use of a Class 25 & 40 combination, during August noted were 25178 & 40181 (4th), 25176 & 40155 (9th), 25213 & 40192 (13th), 25181 & 40044 (17th) and 25201 & 40028 (22nd), incursions by Class 47s becoming more frequent, by October they would be the norm. On August 8th 25176 was noted southbound at Warrington Bank Quay with a breakdown crane and a couple wagons. The next day (9th) 25176 & 40155 were noted on the BOC empties, the 6M59 15.07 TThO Broughton Lane BOC Sidings to Ditton BOC Sidings. Between September 3rd & 6th 25176 worked four passenger trains out of/through Preston, a Blackpool - Manchester Victoria on 3rd, a Preston - Blackpool hop ex-Birmingham on 4th, assisting a southbound electric to Warrington on 6th when the power was off, then returning to Preston to work a round trip to Blackpool North. 25176 was stabled at Speke on September 13th. On the evening of September 20th 25176 was stabled at Rugby. Its last passenger working of 1984 was on October 11th, double headed with 25181, assisting an electric from Euston to Watford due to the power being off. Also on this date 25176 was noted at Whitacre Junction with empty mineral wagons. 25176 was noted at West Hendon on October 12th in charge of a track maintenance train. During November Cricklewood lost its four remaining Class 25s (25048, 25176, 25244 & 25311) to other LM depots, 25176 moving to Carlisle Kingmoor. These re-allocations left the London area depots without any BR/Sulzer Type 2s on allocation. 25176 was noted at Carlisle station on February 23rd. Passenger workings for 25176 in 1985 were scarce. The first came on March 28th dragging a diverted Euston - Liverpool service between Warrington & Lime Street. 25176 & 25125 were stabled at Stoke on Trent station on April 13th. 25176 & 25206 worked the Ellesmere Port - Cranmore bitumen tanks on May 30th. On June 7th 25176 was noted at Norton Bridge with a short freight and on the same day 25176 worked the 3V20 15.10 Manchester Piccadilly - Bristol Temple Meads parcels. On July 22nd 25176 was in charge of the 12.40 Carlisle - Glasgow. 25176 was noted at Earlestown on August 16th with a permanent way train. When the 10.10 Holyhead - Euston failed at Chester on September 3rd behind 47453 it was left for 25176 & 25200 to drag the whole ensemble to Crewe, this pair were later noted on a Ravenscraig - Llanwern coil train. Photograph courtesy Richard Howat Late in 1984 25176 moved north to Kingmoor, leading to possible passenger duties, in the summer months on the Carlisle - Dumfries - Glasgow service. At an unknown date (presumably in 1985) 25176 stands at Glasgow Central with just such a working. On November 22nd 25176 was noted taking the York avoiding line with a very lengthy train of engineering vehicles. On the North & West route on December 4th 25176 became a failure on a northbound freight, rescued by 31134 and dumped temporarily at Hereford. 25176 worked the 6M75 12.55 Severn Tunnel Junction - Mossend on January 6th, being noted at Cwmbran. 25176 was noted eastbound at Manchester Exchange on January 31st with a four coach parcels train. March saw two Class 31s (31259 & 31271) transferred to Carlisle, allowing 25176 & 25278 to be transferred down to Crewe. This was the last transfer for 25176. 25176 was stabled at Buxton on April 26th. 25176 was stabled at Rugby station on May 11th and at Machynlleth on May 26th. On June 2nd 25176 was noted passing Alsager with empty ballast wagons. By the summer Class 25s arriving at Hereford from the north were usually turned round here due to the diminishing number of South Wales crews trained on them. On June 4th 25176 and 25265 arrived on separate freights and were taken off, though 25265 remained in the area on permanent way workings. On July 12th 25176 was noted at Caersws with a breakdown train headed for Machynlleth. On July 16th 25176 hauled 40046 from Moreton-on-Lugg to Crewe on the first part of its journey to Doncaster Works for scrapping. 25176 was stabled at Springs Branch on August 2nd. On September 22nd 25176 was noted running light engine through Rhyl. 25176 was noted passing Saltley on October 7th. October 26th's afternoon Manchester - Bristol parcels was hauled by 25176. November 21st found 25176 rescuing a late night Birmingham - Euston emu after it failed at Denbigh Hall Junction, 25176 was on hand to drag the failure to Bletchley, this was 25176's last passenger working. For 25176 the last week of 1986 was spent mostly in the Chester/Wirral area. On January 8 & 9th 25176 was again on local Chester jobs, though by the 13th had migrated to Warrington. By breakfast on 17th 25176 was at Crewe Depot requiring attention to a traction motor armature, expected release was the evening of January 19th. On 24th 25176 was still in the Crewe area, allocated to the 3K02 05.00 Crewe - Liverpool, returning to Crewe for more local work on 25th. The evening of January 27th saw 25176 at Manchester Victoria, scheduled for the following day's 1P55 02.28 Manchester Victoria to Barrow, returning with the 5P55 empties to Red Bank. After being noted at Bolton in the early evening of the 29th the loco repeated its previous day trip to Barrow (30th). A short time was spent at Newton Heath depot on January 31st before moving to Manchester Victoria. 25176 and a brakevan were noted at Crewe station on February 8th. February 10 - 12th were spent in the Crewe - Shrewsbury area before reaching Machynlleth on the morning of the 14th. Bescot was reached on the evening of the 17th on the 7G25, returning to Crewe light engine late on 18th. By the early morning hours of February 21st 25176 was at Holbeck, allocated to work an empty stock special to Longsight Carriage Sidings (5Z97). After reaching Manchester Victoria it was off light engine to Edge Hill to bring some stock back to Manchester Victoria. Again the 1P55 to Barrow and return empties to Red Bank was handled on the morning of 24th. Later that day it was back at Manchester Victoria on the 1H07. 25176 was noted at Manchester Victoria on February 27th. 25176 was noted at Longsight on February 28th & March 2nd, on the latter allocated to the 0K36 light engine to Guide Bridge to collect the 6K36 to Nuneaton Hartshill. By the early morning of 5th it had arrived at Liverpool Lime Street on the 1F54, being then allocated to the 8X31 to Bury. On the morning of 10th the locomotive returned to Longsight for attention to the valve and rocker gear. Although repairs were expected to be completed by the end of the day, they did not occur, with 25176 now consigned for scrap after a service life of twenty two years. 25176 was withdrawn on March 9th 1987. Photograph courtesy Danny Preston, collection Neil Johnson. 25176 at Longsight, date unknown, but most likely after its withdrawal. No.1 cab front: valencing: rusty patches in several places especially above the m.u. sockets and lengthy gash above dual brake connection: November 1981 (some) - May 1986 (presumably until withdrawn?). No.1 cab front: 2nd man's side: rusty patch to left of electrification flash and on corner at same height as bottom of window: May 1984 - May 1986 (presumably until withdrawn?). No.2 cab front: rust patch below handrail towards center of cabfront: (not August 1985) April 1986 - until withdrawn. No.2 cab side: 2nd man's side: missing paint above valencing on 2nd man's cabside panel: June 1985. (With thanks to Neil Cannon for making available the TOPS reports for 1987). Page added October 16th 2001. Last updated January 7th 2019.